Take one slender young gazelle of a woman who happens to be the itinerant, 60 wrd/min art critic, Lori Waxman. Feed her some artists hoping for critical praise, and you have the ingredients for a performance like no other. There are few clues to hint at Lori’s personality (note first name terms here), except that she is informally dressed and when she does speak, which is not often, it is with a gentle American accent. But she’s over here, and in your area for one day only. Give the critic an office desk with some real potted plants, an assistant receptionist who may or may not be open to bribes, in a room preferably attached to a public art gallery, and the stage is set. The atmosphere is reverend and filled with a slightly awkward air of expectation that something, anything might just happen. The artists and other interested people who stroll into this arena are not quite sure how to behave, and speak in hushed tones. Some visitors may stride in confidently and greet the scribe to which they get an assured response hinting at a level of acquaintance already received. Other visitors may either saunter over to read the reviews already posted on the board, look at the artwork on display awaiting critical attention, or stand and watch the screen as the words tumble out in sync with the letters tapped out on the critic’s keyboard. Here, the very essence of Lori’s working method are publicly exposed: phrases are toyed with, arrested mid-sentence; reworked; checked; words looked up or rearranged in a different order, until finally the review is spat out, emerging in the form of a well-crafted critique. For me it begged the question, why? I wondered why anyone might subject themselves to such a public display of the often messy business of creative flow which to me would feel like spilling my guts. Ms Waxman neatly summed up her answer in an email. “…….. As to your questions, in terms of writing, yes, it does flow quite easily for me, though that doesn’t mean it isn’t very hard work. But just as you have your medium, I have mine, and mine is words. The composure bit is very natural — I’m an exceedingly, even excessively calm person. And the ‘on show’ business is, well, part of why I do the performance. I’m otherwise never on show, since writing is such a solitary art. Having an audience of the people I am writing about is a provocative tension for me.” Ah! I get it now. Some artists, however, just can’t hack it and flee whilst their work is under such intense scrutiny. 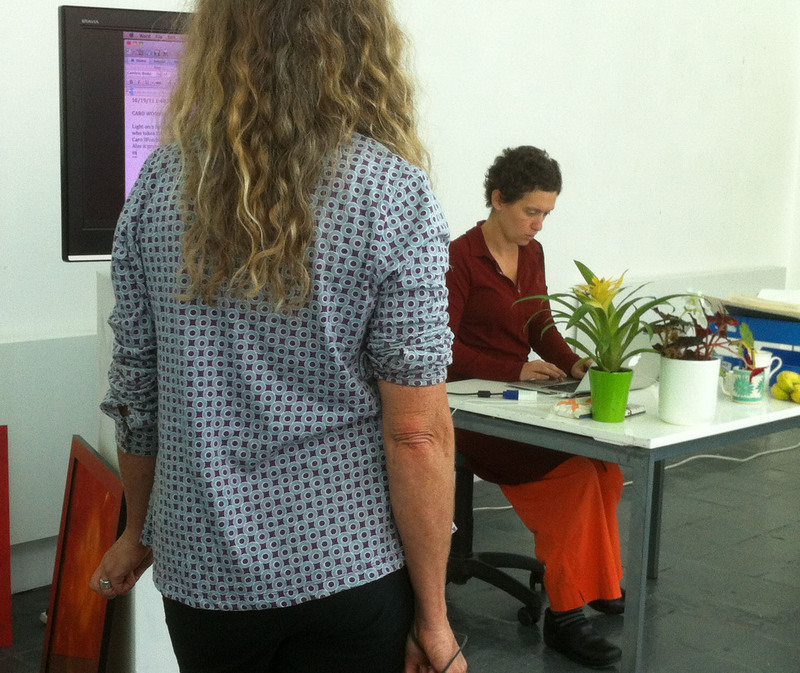 Another artist hovers menacingly behind the wordsmith as she reviews the work. I was curious and stayed to witness my fate, not only keeping a discreet distance but also careful to avoid eye contact in case I interrupted the flow of superlatives that my work was bound to invoke. (Sadly not to be….the review I was gifted with will be published in my next post. I believe all the reviews will be published in the Cornishperson soon).) I was not alone, however, and despite my own wounded pride, I was pleased to have been a willing participant of this unique performance. Thanks Lori. Your work is always a reflection of your true soul, those close to you see you in all that you do. The truth is being ones self.